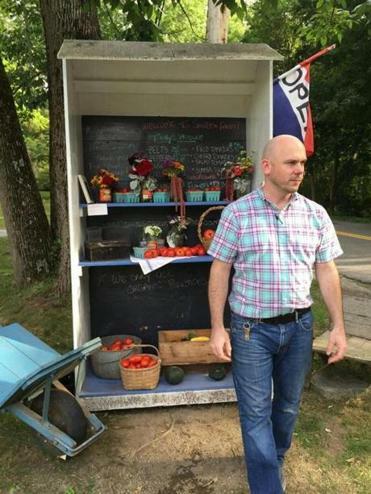 Ralph Fiegel at the roadside farmstand of Saltbox Farm. CONCORD — “Hop harvest!” Mark Congdon yells excitedly out of the window of his SUV as he drives by Saltbox Farm in Concord. It’s a rallying cry offered up to his colleague, Ralph Fiegel, who is tending to the farm’s roadside farmstand. They exchange smiles and waves, and Congdon continues on. Another SUV slows down on the narrow lane; this vehicle stops and its driver hops out, and is soon eyeing the farmstand’s ruby red tomatoes and emerald green zucchini. She needs some tomatoes for dinner and within a couple minutes, off she goes with the plump berries on her front seat: From farm to her table. Congdon recently took over from Fiegel as farm manager at the charming Saltbox Farm. It’s an amicable changing of the guard because Fiegel is relishing his new challenge: He is now the head brewer — or, rather, the brewer. It’s a one-man operation right now, begun in July, when Saltbox Farm added beer to its multiple doings, which includes a restaurant, Saltbox Kitchen, in nearby West Concord; a catering service; a CSA; and cooking school. The small batch brewery is located inside Saltbox Kitchen, which serves farm-to-table food, six days a week. Everything starts with the farm, though, and Saltbox Kitchen beer is made with hops and other ingredients grown there. Saltbox Farm’s roots reach to owner, or farmer, Ben Elliott’s grandfather, who built the main farm in the 1940s in a traditional saltbox style: that is, with one side of the roof longer than the other. Grandpa Elliott added the smaller building known as The Little House in the 1960s. He built that in an old English style and included flagstone floors, big brick fireplaces, and wood paneled walls. It feels utterly authentic, and as far from the ’60s mid-century modern concept as you can get. Elliott Jr. took over the farm in 2009 and began building his business. The Little House is now the farm’s cooking school, which is overseen by Chef Aran Goldstein, who had come on board in 2013 to head Saltbox Farm’s rapidly expanding catering business, and who helped open Saltbox Kitchen in July 2015. Like Elliott and Fiegel, who are both No. 9 Park alums (and then some: their restaurant biz resumes are impressive), and Congdon, who spent a decade managing Francesca’s Cafe in Boston’s South End, Goldstein’s been there and done it with chef stints at Clink at Boston’s Liberty Hotel, three variously Michelin-starred restaurants in Liguria and Tuscany; and Sur La Table’s flagship Manhattan location. For all this, to the average passerby, Saltbox Farm looks like an authentic slice of 1800s New England, a time when this area was thickly wooded and newly settled by would-be farmers, as recounted by Thoreau. Walden Pond is about a 10-minute drive away. It’s a quiet stretch of road where small family farms like Saltbox are rebounding as CSAs and farm-to-table eating picks up steam, turning the tide against factory farming. Old ways, such as crop rotation and land management without chemicals, are relearned. Animal inhabitants include hens and a rooster, bees (in a handful of hives providing honey and helping to pollinate the crops), and several sheep, all of which arrived in the spring and will be on the plate come the end of October. Fiegel shrugs. “They’re happy while they’re here,” he says of their short life in the meadow. The sheep keep down the grass and fertilize. Next to the fruits and vegetables, several rows of hops rise up on a series of strings held aloft by mighty wood poles. This summer’s drought has not been kind to crops. Fiegel eyes the beautiful pale green buds. It could be worse. With the sun lowering its glare and slowly slinking to the horizon, Congdon sets up a tall ladder only an acrobat would attempt to mount, and begins the hop harvest. Fiegel heads over to the brewery to get busy on his next batch of beer. In this windowed booth in the restaurant, Fiegel admits he turns into a mad scientist, monitoring all chemical reactions between ingredients, logging each step in his manual. He’s been lucky and only a couple of batches went down the sink. He once made a pale ale that was literally “burping sulphur,” he says. “But luckily, I haven’t had too many disasters.” He initially underestimated popularity and demand; by early September customers had consumed all the beer. So, he’s not taking any chances. Saltbox Kitchen has its first beer dinner on Oct. 22, and is keeping up production. SALTBOX KITCHEN 84 Commonwealth Ave, Concord. 978-212-3585. www.saltboxkitchen.com.